If you use twitter on mobile using their official app, you may have come across a new feature which enables you to open a stripped-down text-only version of link within the twitter app. It's not an excerpt of the article but the entire text minus images and html. There's no branding, author's name, website's name, sponsor's name etc. Though there's an option to 'OPEN IN BROWSER' on top-left. There has been no official announcement of this feature on twitter's official blog and has been launched silently. Though the user reaction to it could be mixed. Some love it since they don't have to visit the website on the browser, but some find it irritating, since they want to view images, comments etc too, and find the added click annoying. 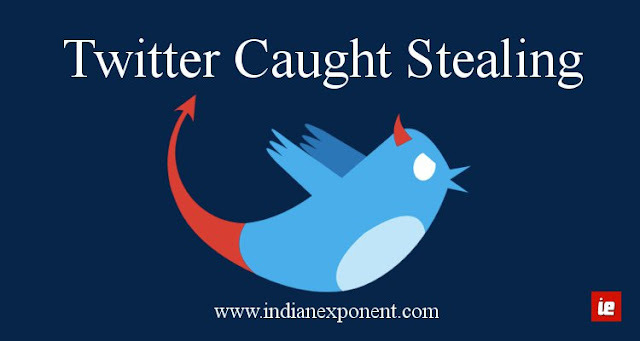 From content owner's perspective, this new approach of twitter to bypass websites is illegal and blatant violation of copyright, and will eat into their business and brand. Most content based websites are ad supported and leaking the entire text of an article amounts to stealing in the name of user experience. Facebook app too has a feature to open a link with the app, but it's the complete website which loads and not a stripped down version. An example of the stripped down version as it appears on Twitter App. Not to mention, violates the rights of the authors, erodes brand and is unfair to sponsors - just directly serves the content to the reader. Twitter does not own this content and it can not be emphasized enough. There's no authorization mechanism to allow this feature to those publishers who want and exclude the rest. This feature is unlike 'preview' which is used by social media websites to help user decide whether they want to click the link. 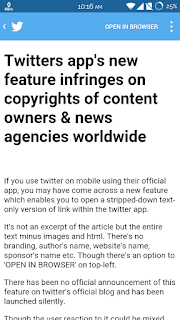 Instead it works as a function to not let the twitter user leave their app, so technically aims at maximising twitter's commercial benefit at the cost of content owner. This feature should be rolled back and if have to be introduced, exclusive authorization should be seeked from individual websites. 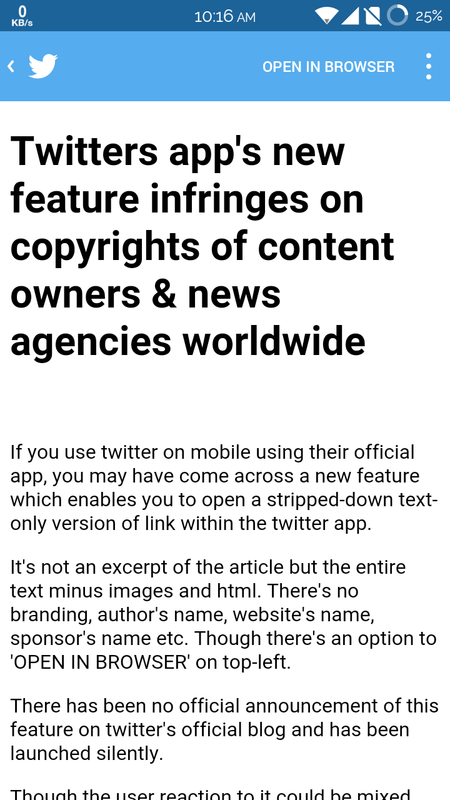 Some techies have highlighted how Twitter is simply opening the link in an in-built mini-browser which strips down the article to bare text. This explaination may be an interpretation, however, this is how it works in the background; what a user sees is a link opening with the complete content of an article minus the author, website's name, branding and sponsors. So tehcnically, Twitter serves the content for free, improving it's interface, at the expense of content owner's revenue. If not copyright violation, this definitely an unfair business practice which breaches on the rights of a content owner. Imagine if all mobile based apps start employing this approach of internal mini stripped down browser, it'll completely destroy the economy of ad-supported content on the web. Here's another 'Net Neutralilty-esque' issue in the making.